Everyone has their own version of chicken potpie. 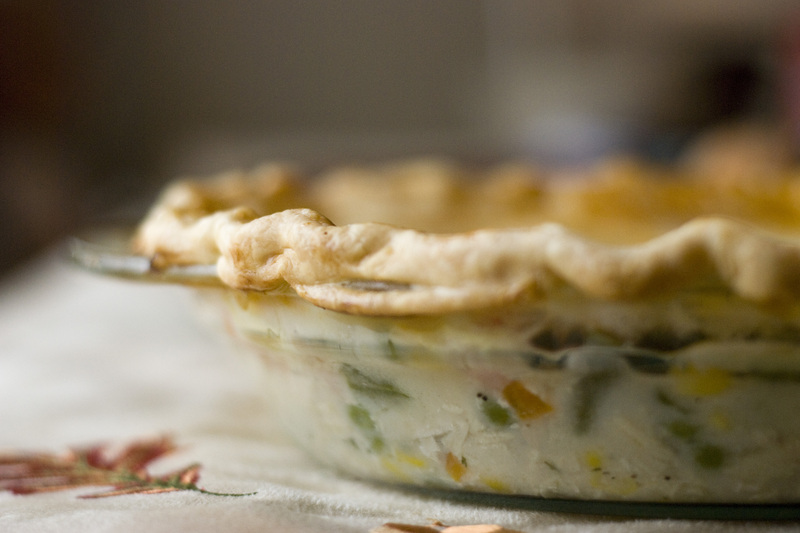 I wanted to make a version of potpie with no “cream of” soups. No more canned anything, but still wanted a fast recipe. This recipe came out thinner than canned potpie versions, but made up for it in taste. The whole thing was gobbled up. 1. Preheat oven 400 degrees. In large skillet, melt butter. Add chicken and cook until cooked through. Add onion and cook 2 more minutes. 2. Stir flour into chicken mixture. Add broth, half and half and parsley. Bring to a simmer, then cover with a lid. Reduce your heat to low and simmer for another 10 minutes. 3. Stir in the frozen veggies. Add some salt and pepper to season. Pour mixture into a 9″ pie pan. 4. Lay the pie crust over the potpie mixture and press the dough into the rim. Cut 3-4 slits into the dough. 5. Place pie pan onto a cookie sheet to guard against spillage and bake for 30 minutes. I use a pie crust shield on all my pies, but that is up to you. Let sit at least 10 minutes before serving.